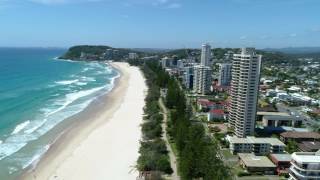 Burleigh Esplanade, located on the beach at Burleigh Heads, offers the most spacious one, two and three bedroom holiday apartments on the Gold Coast. The unique twin octagonally shaped towers consist of 25 levels giving you breathtaking panoramic views from every floor. Each tower contains only one 16.9sqm apartment per floor and offer beautiful 360 degree ocean views, magical views to Surfers Paradise in the north, views of Coolangatta in the south and views of the subtropical Hinterland from private balconies at the rear of the apartment. These elegantly appointed holiday apartments are individually furnished and feature an ensuite, fully self contained kitchen and second bathroom including laundry. All you need do is relax and enjoy! Enjoy a holiday by the beach in one of their economical two bedroom budget apartments with ocean views. All apartments are fully self contained with a spacious living and dining room area. Full kitchen and laundry are also provided. With a queen bed in the master bedroom and two singles in the second bedroom, your family will be at home while enjoying the stunning ocean views from your private balcony. Please note that these apartments do not have air-conditioning. Ceiling fans are installed throughout while you enjoy ocean breezes. This apartment sleeps four guests although can sleep fifth guests with an additional bed. Their standard ocean view apartments are spacious and feature a fully equipped kitchen, large lounge/dining room, and your own private balcony overlooking the magnificent Burleigh Heads Beach. The master and second bedroom also include private balconies overlooking the Gold Coast Hinterland. The main bathroom has a washing machine and dryer to complete your home away from home. In room facilities include a large television with Foxtel, free unlimited wi-f and ironing facilities. Please note the standard apartments do not have air conditioning, ceiling fans are installed. There are two apartments per floor which are 16 square metres internally and have six square metres of balcony. They have ocean views from the living / dining area and the third bedroom. They have hinterland views from the master bedroom (queen bed) and second bedroom. They have full kitchen facilities including oven, cooktop, fridge, microwave and dishwasher. The master bedroom has an ensuite. The second bathroom/laundry has a shower or shower/bath. Linen is supplied. They have direct dial telephones (local, national and international calls at cost). The rooms are wheelchair accessible. Their beautifully renovated Superior Apartments are the perfect place to treat yourself to a relaxing holiday. These spacious apartments have a fully equipped kitchen, large lounge/dining room, laundry and a very spacious balcony overlooking the magnificent Burleigh Heads Beach. The master bedroom (king bed) and second bedroom also include private balconies overlooking the Gold Coast Hinterland. The main bathroom has a washing machine and dryer to complete your home away from home. In room facilities include a large television with Foxtel, free unlimited wi-fi, ironing facilities and air conditioning. This apartment sleeps four guests although can sleep a fifth guest with an additional bed. With stunning ocean views from the living / dining area and hinterland views from the bedrooms, you will be more than pleased with the coastal vistas. All of their superior apartments have air-conditioning in the lounge and bedroom. Full kitchen facilities including oven, cooktop, fridge and microwave are provided. The master bedroom has an ensuite. The second bathroom/laundry has a shower or shower/bath. Linen is supplied. The room has a direct dial telephone (local, national and international calls at cost). The room is wheelchair accessible. When you have a large family, their three bedroom Ocean View Apartments are the perfect choice. Renovated and spacious, with a fully equipped kitchen, the large lounge/dining room is the place to relax. Or enjoy walking onto your private balcony overlooking the magnificent Burleigh Heads Beach and watching the waves crash on the shore. With private balconies also attached to the master and second bedroom, your family will be in for a treat. In room facilities include large television with Foxtel, free unlimited wi-fi, ironing facilities and air conditioning. This apartment sleeps four guests although it can sleep a fifth guest with an additional bed. With air-conditioning in the lounge and bedroom, full kitchen facilities including oven, cooktop, fridge, microwave and dishwasher and an ensuite to the master bedroom, you will be right at home. All apartments have direct dial telephones (local, national and international calls at cost), television, Foxtel, king beds in the main bedroom, second television in the main bedroom. 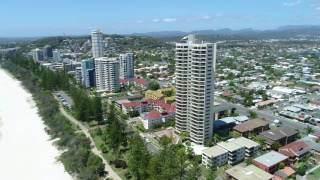 This Burleigh Heads Penthouse has a Zero Party Policy and can only be booked directly with them. As you walk into this four bedroom Penthouse you will be swept away in a dream, positioned on the 25th floor, it does not get much better! The split level apartment allows you to take full advantage of the breathtaking 360 degree view of Burleigh Heads, Coolangatta and Surfers Paradise coastline. The Penthouse offers the luxury of King Beds in both the master and second bedroom, the third bedroom features a Queen Bed and lastly the fourth includes two single beds. All bedrooms have wall mounted televisions and air conditioning. The fully equipped designer kitchen is an entertainer’s delight featuring stone benches and stainless steel appliances; you also enjoy the smell of freshly made coffee from the Nespresso machine or even better make a loaf of freshly baked bread in the Bread Maker provided. Together with large living and dining areas, the penthouse also has wrap around balconies with coastal and ocean views. This Apartment is perfect for couples or a family getaway. The Penthouse is set to impress you and your guests make sure your do not miss out on this experience.